Samsung has taken out full-page advertisements in major US newspapers in an attempt to apologize to its customers for the recent Galaxy Note 7 explosions that led to a global product recall. When it was first released back in August, reports began to surface of devices overheating and exploding due to a fault with their lithium-ion batteries. 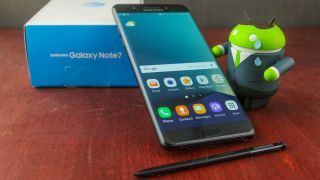 Following a recall of millions of units in September, Samsung decided to permanently discontinue the line when its replacement phones suffered the same faults. Despite repeatedly warning customers that the phone isn’t safe, not all customers have returned them, though Samsung says around 85% have now been returned or exchanged. It’s been a difficult period for the company, which has resulted in its third quarter profits taking a significant hit. Its reputation with consumers hasn’t been helped by another embarrassing recall, this time for 34 models of its washing machines, which it also acknowledges in the ads. So far the company has recalled 2.8 million units in the US after it was discovered that the tops of the washing machines could come loose and fly off while in use. Samsung has received more than 700 reports so far and nine people have been injured according to the US Consumer Product Safety Commission. Whether a pricey apology will rebuild trust will be down to the public though.